The 2016 Olympic football tournament will kick off in three months on August 4th, when South Africa take on hosts Brazil in Brasilia. While European attention may be drifting away from a perceived Micky-Mouse event to their own continental tournament earlier in the summer, experience dictates that African and Asian viewers will be gearing up for one of the most important competitions in the international football calendar. We can point back as recently as London 2012 where the likes of Mohamed Salah and Omar Abdulrahman came of age onto the global radar after impressive tournaments in the colours of Egypt and UAE respectively. Martin Lowe takes up the mantle to guide you through the six nations qualified from our regions and what to look out for in the coming three months in the run up. As a seeded team, Japan at least knew they were going to avoid one of the big guns from the Americas, including hosts Brazil, but will still feel hard done to by a draw which leaves no guarantees of progression to the knockout stages. They have managed to pick up the only other South American nation in the competition in Colombia, alongside two continental champions in Sweden and Nigeria. Group B instantly looks the toughest draw of them all on paper. Japan should have their full Asian U23 winning squad at their disposal after Takumi Minamino (Red Bull Salzburg) and Yuya Kubo (Young Boys) were given clearance to join up with the Olympic squad by their European employers. Much of the talk instead, like most nations at this tournament, has surrounded the three overage nominations. This will leave coach Makoto Teguramori with little choice other than to focus on the domestic market, which all things being considered isn’t too bad compared to their competitors’ respective pool of talent. 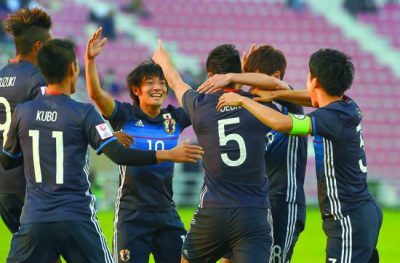 Waiting in the wings are Samurai Blue regulars Gaku Shibasaki and Masato Morishige, while a swansong to national team football for Yasuyuki Konno or Yasuhito Endo in Brazil could also look appealing. It has been a whirlwind start to 2016 for Wataru Endo, moving to Japanese giants Urawa Reds over the winter break before clinching the U23 continental title within the first two months of the year. Since then he’s established himself within the midfield of the J-League’s leading side, whilst ensuring himself some Asian Champions League experience to boot. He will be one the most experienced players in the squad, possibly even surpassing those of his overage colleagues, given his early inclusions in the senior national team. How his performances blossom over the coming months with Urawa will be fascinating viewing. Qualified as Champions from Africa’s U23 Cup of Nations in December. Nigeria’s U23 continental triumph last year was accomplished through the inclusion of mainly domestic based players, with only a couple including player of the tournament Okechukwu Azbuike at the time plying their trade in Europe. Since then Siasia has called up a much changed side for their March clash with hosts Brazil (a match the Super Eagles edged 1-0). This squad included the likes of former Standard Liege striker Imoh Ezekiel and Tottenham Hotspur youngster Nathan Oduwa, who has only just switched allegiances from England. Whether this is a sign of things to come when they return to Brazil in three months’ time is unknown, however Siasia has reiterated that his squad will be made up from broadly players that clinched qualification last year. When it comes to the overage picks for the squad, nothings been confirmed yet, however there’s a host of names already being tipped for selection. John Obi Mikel and Ogenyi Onazi have shown public interest in being selected, while there’s serious clamour for the in-form Odion Ighalo and veteran Vincent Enyeama to be given the nod. The most persistent push however surrounds two of Nigeria’s European based underage forwards in Manchester City’s Kelechi Ineanacho and Arsenal’s Alex Iwobi. Both have been approached by the Nigerian FA, with further discussions likely to come their clubs way in the next couple of months. One of the only glimmers of light in Nigerian football of late has been sparked by striker Oghenekaro Etebo. On the back of his golden boot performance in Senegal, of which 2 of his total 5 strikes came in the final against Algeria, Etebo moved from Warri Wolves in Nigeria to Portuguese second tier side CD Feirense, where he has recently broken his duck in his second match. Alongside his accelerating club career he has picked up his first senior caps and his first senior goal, the opener against Egypt in his country’s doomed attempt at qualifying for next year’s senior AFCON. Etebo is clearly a man hitting a crest of a wave, who needs to be cared for in the run up to Rio. Much will depend on which European-based stars will be added to the roster in the un up to the tournament, assuming the likes of Ineanacho, Ighalo and Iwobi could all be included, Etebo runs the risk of being side-lined in favour of the glitzy names. A much clearer picture should come into view over June’s international break. Qualified as Runners Up from Asia’s U23 Championships in January. The draw for the Koreans was a pretty mixed bag, given they drew the likes of defending Olympic gold medalists Mexico and (all be it a younger cohort from) World Cup winners Germany but also face perceived whipping boys Fiji. Contrary to these initial opinions, Korea can garner hope that Mexico have indeed lost to Japan in March, a side Korea were only edged by in January’s U23 championship final, and that Germany for all their established Bundesliga names that appeared at the U21 Euro last year, could be missing plenty of them given the league season kicks off on the 26th August, and that the seniors may handpick some of their crop for the senior EURO earlier in the summer. It’s wise to live by the saying that you should never rule out anyone, however Fiji’s qualification from the Oceania region may not all be so clear cut. It came at the expense of usual qualifiers New Zealand who were disqualified earlier in the preliminaries for fielding an ineligible player, going on to only qualifying by the skin of their teeth themselves beating Vanuatu in the playoff on penalties. Olympic success is clearly being prioritised by the Korean FA, with the likes of Moon Chang-Jin and Kwon Chang-Hoon being held back from senior team call ups to continue on with the U23 squad, thusly the squad that progressed to the final in January will be similar from a point of the view of the underage players. From the perspective of the 3 overage births granted, South Korea’s talisman in World Cup qualifying Son Heung-Min has been guaranteed a place on the plane to Rio (2 years since those tears on the pitch in Sao Paulo) after his club and the KFA negotiated the strikers withdrawal from a senior call up in March in exchange for an early August selection. Joining him in that department again remains just speculation, however the most prominent names being touted are European based Hong Jeong-Ho of Augsburg and Porto striker Suk Hyn-Joon. The former looks in a better place given coach Shin Tae-Young’s confirmation that he’ll look to use the remaining two wildcard spots to bolster Korea’s defence. One player looking to use the Olympics as a springboard towards better things is Kwon Chang-Hoon. If he can add to his escalated rise with his club side Suwon in the K-League and Champions League alongside a silver medal in Qatar, you’d be hard pushed to predict he’d resist offers coming in from Europe. With the K-League season set to run for a number more months into the summer before the Olympic break, all eyes will be fixed on the Korean attacking midfielder, in hope that he doesn’t blow up prematurely. Qualified as Runners Up from Africa’s U23 Cup of Nations in December. Considering the pots Algeria will be pleasantly pleased with their run of matches in Rio. Their opener against Honduras looks the easiest on paper, however the Central American side did beat USA in qualifying, while Portugal and Argentina’s squads are likely to be depleted due to involvement elsewhere in the summer. Argentina, unlike the hosts Brazil, are putting greater emphasis on the Copa America over the Olympics, and will likely name a similar squad to that of their South American Youth championship winning squad which lacks any real big name. One talent to keep an eye on however is Atletico Madrid’s Angel Correa who is already being touted as the key man of the whole tournament. Algeria’s senior side are arguably in the best place they have ever been, and their youth ranks are keeping up with that improvement, qualifying for their first games since 1980. The U23 squad that made it to the final in Senegal back in December was a broadly domestic based squad, and while the likes of in-form striker Oussama Darfalou of USM Alger will go straight into the fold once again, Swiss coach Pierre-Andre Schurmann could call upon some of the seniors including Ramy Bensebaini, Nabil Bentaleb and Yassine Benzia as underage squad bolsters. Regarding the overage trio to be named, all eyes will be watching to see if one of their key quadruple will be granted time to fly with the squad to Rio. English PFA Player of the Year Riyad Mahrez tops the interest list, but any or all of Sporting’s Islam Slimani, Porto’s Yacine Brahimi or Valencia’s Sofiane Feghouli will well and truly fit the bill. A week on from becoming the first Arab player to win the Premier League with Leicester City, Riyad Mahrez will no doubt be linked heavily with an Olympic call up over the summer. While he may not be playing in the meantime, apart from the June internationals, Mahrez’s possible destination come the beginning of the 16/17 season could prove a determinable factor in whether he travels to Brazil or not. If as reported, a so-called bigger team comes in for him, be it a PSG, Manchester City et al, or, if Leicester somehow persuade him to stay, a career boosting Olympic inclusion could be one bargaining chip both sides could play to entice the playmaker to stay or go. Much will depend on the player’s desire to take part, if so he’s holding all the cards after such a fine season. Qualified in third place from the Asian U23 Championships in January. The team to avoid from the start was always going to be Brazil, and unfortunately from an Asian/African stand point, we have two nations drawn against the hosts. Looking past an assumed second place chase, the rest of the group looks wide open for Iraq; South Africa limp through as Africa’s weakest side on paper, while Denmark are likely to field a domestic/regional based squad for their underage contingent. The one caveat to this is that Denmark failed to qualify for June’s Euro 2016 tournament, opening the door to a possible overage inclusion for the likes of Christian Eriksen and Kasper Schmeichel. Iraq have one of the youngest senior squads in Asia, and thusly have an experienced and deep U23 squad to take to Rio. A preliminary squad of 35 has been named by coach Abdul Ghani Shahad who has been sharing his U23 role with the seniors since the last international break, including a wealth of European based talent including Ali Adnan, Dhurgham Ismail and Sherko Karim, who will all qualify as underage participants. Their overage selection, yet to be finalised as the Iraqi FA consult each player’s club for their availability, has been shortlisted to seven players; Yaser Kasim, Ahmed Yasin, Ahmad Ibrahim, Walid Salim, Saad Abdul-Amir, Justin Meram and Jalal Hassan. Those expecting a return for Younis Mahmoud will be severely disappointed, Shahad confirmed as he published the call ups that he will only be looking at players who fit the younger age profile he wishes to adopt in his final squad. Within what was another travesty turned lucky progression for Iraq which was the March international window, Justin Meram’s immediate recall mid-way through the week directly after Shahad was appointed as caretaker is the clearest of signs that the coach and player will do anything to connect again in Rio. Qualified in third place from the African U23 Cup of Nations in December. As discussed with Iraq, drawing likely the strongest side in the tournament in hosts Brazil is far from ideal, given the South Africans will have to open the games against them on August 4th. The counter argument can be put to them however, that they have nothing to lose from the first whistle, allowing them to consider the final two challengers once their head-to-head is out of the way. There’s been a sense of anti-climax over South Africa’s qualification for Rio, mainly spurred on by the fact they only narrowly qualified for the tournament. In qualification, they only scraped through on penalties in the third placed play off, they also finished on an overly negative goal difference and failed to really unearth a notable talent. The overage/European based selections look pretty underwhelming also for coach Owen da Gama. It is assumed Tokelo Rantie, currently an underused member of Premier League side Bournemouth, will spear head the attack as one of the overage wildcards, while clinching the services of their other star name Thulani Serero may prove much trickier. As we await a final list, you should not be too surprised to only see a couple from outside the domestic game featuring. Given the lack of star names to bolster the ranks in Rio, dependency may fall on some more unfamiliar shoulders. Looking to the future, 18 year old midfielder Phakamani Mahlambi looks a key player to watch in the run up to the games. The youngster impressed in Senegal, notching an assist in the playoff game with the hosts in the Olympic playoff, while domestically he has been able to secure regular football in PSL outsiders Bidvest Wits. At the very least he is a key talent to nurture over the tournament.